Randall Tiedman is a highly intuitive self-taught artist. He is also a skilled draftsman who spent nearly four years during his early career copying old master paintings to acquire technical proficiency in oils and various graphic media. He typically works on his paintings over a long period of time, beginning with a familiar image, then subjecting it to a series of destructions and reconstructions, which may be metaphorically compared to a process of death and rebirth. After building up the surface with various media, he mars and scrapes it, leaving mysterious presences where objects or forms have been removed – as if to suggest that these rough, pitted surfaces have been “lived in”. This process, so essential to releasing imagination and subconscious associations, produces deeply felt images of obsessive intensity. He was accepted for an advanced standing at the Cleveland Institute of Art after his tour of duty in Vietnam but decided to pursue art on his own. He did not publicly exhibit his art until he made his gallery debut in the Proscenium ’82 at the Beck Center in Lakewood, Ohio. The following year he was selected for inclusion in an exhibit at the Cleveland Museum of Art that was curated by Sherman Lee. Since then, Tiedman has received more than 29 awards in juried exhibitions including the Erie Art Museum, National Arts Program, the Hallinan Religious Show and the Fine Arts Association. He has been selected for inclusion in juried shows by Don Eddy, David Hickey, James Harithas, Sherman Lee, Tom Hinson, and by Terry Dintenfass for first place in the National Butler Institute of American Arts mid-year show. His work has been shown at Bang and Olfsen galleries in New York, Istanbul, Turkey, and Frankfurt, Germany, as well as numerous invitationals. 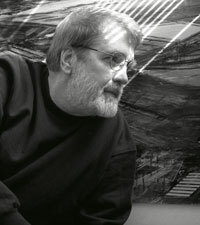 His works are also in the collection of the Butler Museum of American Art, The Erie Art Museum, Case Western Reserve University, Lakeland Community College as well as private and corporate collections across the United States. In 2002 his works were purchased by Cirque de Soliel.